Les DVD, Jeux, Blu Ray et CD d'occasion ne sont ni repris ni échangés (ils ont fait l'objet d'un test avant l'envoi). Chèque bancaire. Damon Hill, 1994. ONYX, 1/24. F1 Williams Renault FW16. MINARDI FORD LEYTON . 2 voitures de course F1. Boite un peu sale ! FORMULE-1ONIX . Size : 1/43, New condition with Crystal Box. Finest MiniatureONIX. WILLIAMS RENAULT FW16. 01960 PERONNAS. ZAC de Monternoz. VENDEZ SANS SOUCI / CHRYSO2009. EXPERTISE, SUCCESSION. 2 EXPERTS A VOTRE SERVICE. 150 m² d'exposition. A PERONNAS (01960). Onyx Jordan scale model F1 voiture de course. LOTUS MUGEN 107 C. DRIVERS - JOHNNY HERBERT. HERE I HAVE A MODEL PRODUCED BY. ONYX MODELS. IN 1/43 SCALE. REST OF WORLD. £ 7.20. 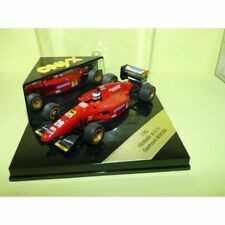 Onyx Ferrari 'Jean Alesi' model which is in mint condition, the box has minor storage wear. Race series Indy. Racing Team Miller. Driver Al Unser Sr. Des photos sont des moulés sous pression qui seront expédiés. Pour tous nos amis internationaux & pour les commandes nationales avec plus de 1 point. WILLIAMS RENAULT FW15C. DRIVERS - ARYTON SENNA. HERE I HAVE A MODEL PRODUCED BY. ONYX MODELS. IN 1/43 SCALE. 1994 TEST CAR. REST OF WORLD. £ 7.20. DRIVERS - JEAN ALESI. FERRARI 412 T2. F1 '94 COLLECTION. HERE I HAVE A STUNNING MODEL PRODUCED BY. ONYX MODELS. IN 1/43 SCALE. REST OF WORLD. £ 7.00. No. 15 car as driven by Mauricio Gugelmin. LEYTON HOUSE MARCH F1. Made in Portugal by Onyx Model Cars Ref: 087. The is an ex. The model however is in very good condition having not been removed from the display base. 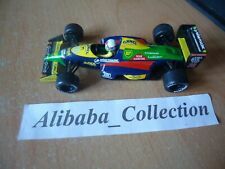 ONYX 186A; Benetton Ford B193B Formula 1; 1994 JJ Lehto; RN6 Test Car. Benetton Ford B193B Formula 1. 1994 JJ Lehto; RN6 Test Car. ONYX: No.186A. Collectable Diecast model in 1:43 scale. Leyton House March. Ivan Capelli. PACIFIC ILMOR PR01. DRIVERS - BERTRAND GACHOT. HERE I HAVE A MODEL PRODUCED BY. ONYX MODELS. IN 1/43 SCALE. REST OF WORLD. £ 7.20. Larrousse Lamborghini. Model No. 090. WILLIAMS RENAULT FW15B. DRIVERS - ALAIN PROST. F1 ' COLLECTION. HERE I HAVE A STUNNING MODEL PRODUCED BY. ONYX MODELS. IN 1/43 SCALE. REST OF WORLD. £ 7.20. THIS IS A PREOWNED MODEL. Onyx 1991 Alain Prost Ferrari 643. 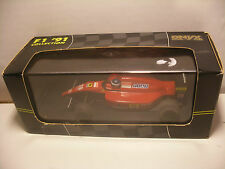 Onyx 1991 Alain Prost Ferrari 643 F1 Car. 1:43 size and in a boxed new condition. Why Buy From Us?. 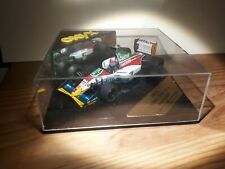 Onyx Model Cars Formula 1 90's Collection of the Benetton B190 Nannini Formula 1 Racing Car. Model number 079. Scale is about 1/43rd, 105mm long. Very nice clean condition in it's clean box. Lola Indy Car. ONYX: No.102. FORTI FORD. HERE I HAVE A MODEL PRODUCED BY. ONYX MODELS. SPANISH G.P 1996. IN 1/43 SCALE. REST OF WORLD. £ 7.20. TYRRELL HONDA 020. DRIVERS - STEFANO MODENA. F1 '91 COLLECTION. HERE I HAVE A MODEL PRODUCED BY. ONYX MODELS. IN 1/43 SCALE. REST OF WORLD. £ 7.00. THIS IS A new MODEL. WILLIAMS RENAULT FW17. DRIVERS - DAMON HILL. HERE I HAVE A MODEL PRODUCED BY. ONYX MODELS. IN 1/43 SCALE. REST OF WORLD. £ 7.20. 036 BMS Dallara F189 - Alex Caffi. 1/43 Scale Die-cast Model by Onyx. 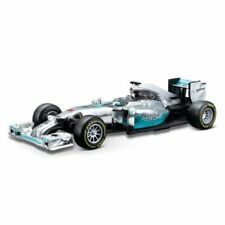 A collection of 12 1:43 scale die cast Formula 1 race car models. Williams Renault FW16 Damon Hill 203 & Tyrell Yamaha 020 C De Cesaris 165. One has a light crack. A varied collection of car manufacturers and drivers and years. WILLIAMS RENAULT FW15c. DRIVERS - ALAIN PROST. F1 ' COLLECTION. HERE I HAVE A STUNNING MODEL PRODUCED BY. ONYX MODELS. IN 1/43 SCALE. REST OF WORLD. £ 7.20. THIS IS A NEW MODEL. Usually the photos are high quality taken from a close distance to show detail. If the pictures were taken on the green board - Every square equals to 1 cm. New in Box. BENETTON FORD B194. DRIVERS - M. SCHUMACHER. HERE I HAVE A MODEL PRODUCED BY. ONYX MODELS. IN 1/43 SCALE. REST OF WORLD. £ 7.20. Il s'agit d'une Onyx Indy Cars Collection '93 Molson Danny Sullivan échelle 1:43. Racing Team Molson. Driver Danny Sullivan. Race series Indy. Des photos sont des moulés sous pression qui seront expédiés. 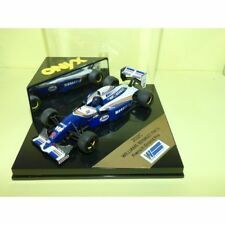 Onyx Model Cars Formula 1 92's Collection of the Tyrrell 020B Olivier Grcuillard Formula 1 Racing Car. Model number 141. Scale is about 1/43rd, 105mm long. Very nice clean condition in it's clean box. 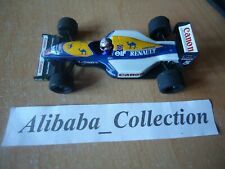 Onyx 1.43 David COULTHARD WILLIAMS RENAULT FW16. Rare Test Voiture 1995. Unusual Onyx no 232. David Coulthards Williams Renault FW16 Test Car 1995. Slight bit of 'touch up' on side of rear wing.